I wasn’t going to say anything, but when CNN started featuring their misguided article about Israel, the West Bank, and Gaza, I felt I had to speak up, because the piece reads like a deliberate attack in the guise of journalism. Everyone has a bias. And hard facts will always be open to soft interpretation in anything as complex as a modern country, particularly one continuing an evolving 3,000-year-old culture at the crossroads of three major world faiths. I’ve written about Jerusalem, for example, and presumably some people didn’t like what I wrote. So I’m not surprised that CNN’s author highlights the connection between the Quran and the Muslim Al-aqsa mosque even though he omits the Bible’s many references to the Jewish Temple. Nor am I surprised by the author’s claim that the Israeli security barrier was “built to keep Palestinians from moving freely.” I don’t believe it was, and I believe that the author’s spiteful words hinder serious conversation about the unintended consequences of battling terrorism. But still, we might attribute these shortcomings to editorial voice on his part. The factual mistakes are more troubling, like the author’s indication that the Western Wall was part of the Temple (it was and is the western retaining wall that supports the Temple Mount upon which the Temple was built), or his mistaken explanation that Judaism is simply a religion (contradicting, for example, the eminent Rabbi Ammi Hirsch). These are common mistakes, though, noteworthy only because CNN is promulgating the misinformation this time. The real problem with these “10 things” is the ninth one, where the author apparently confuses the Palestine of antiquity with the modern Palestinians. “When you visit Israel,” he writes as a caption, “you’re also visiting biblical Palestine.” “Palestine” is one ancient name for the area that includes Jerusalem, so “biblical Palestine” is almost right. But Teller then takes the shocking step of using modern “Palestinian culture and the Arabic language” as an example of Israel’s biblical culture. There is lots of legitimate room for disagreement when it comes to the Middle East. But no one of repute believes that the ancient, Jewish, Israelite inhabitants of ancient Palestine are the same as the modern Christian and Muslim Arabs who call themselves Palestinians. They just happen to have the same name in English. There is no reasonable justification or excuse for equating the two. Yet that’s what CNN does here. There’s an old adage that one should never attribute something to malice if it can be explained by ignorance, so along with any other reader who cares about the Middle East, I have to ask: is CNN’s gross bias here born of prejudice or ignorance? Thank you Joel for a very succinct and intelligent commentary on the misinformation contained in Mr. Teller’s article. Excellent post, Joel! Thanks for writing about this. I am also wondering whether a lot of the ignorance about the Middle East comes from malice: first, the truth is perverted by those who should know better (and I believe do know better, but lie on purpose), like the CNN “journalists”, and then the masses learn only half-truths, lies, and damn lies (rarely do they learn any true statistics, I might add). As for Anthony Bourdain, I’ve noticed his tendency to talk about history, politics and the likes of the places he does his food-centered shows in, but he often knows little and simply spouts nonsense that he doesn’t have the brains to process first. After his show where he was caught in Lebanon during the latest war there I stopped watching. He really disgusts me. I hope people realize that he might be a good cook, but his understanding of wider issues and opinion on them are not worth listening to. It’s clear you have no concept of the bigger picture that your have more opinion than actual insight. I don’t believe anyone has the full truth since the real issues haven’t been solved. The controversy of this topic is what makes it difficult to properly portray which is probably why nobody talks about it on air in such a way. Out of all the news I’ve seen I have had no such experience of humanizing the people living there. They are often referred to not as people but as opposers. Now I know the CNN is biased but we all need to look past the fact that no matter where you go in the world news is misrepresented. However I can at the very least applaud him for having first gone there risked his skin to show real people rather than simply posting his opinions on a blog. Thanks for your comments, Jaques. 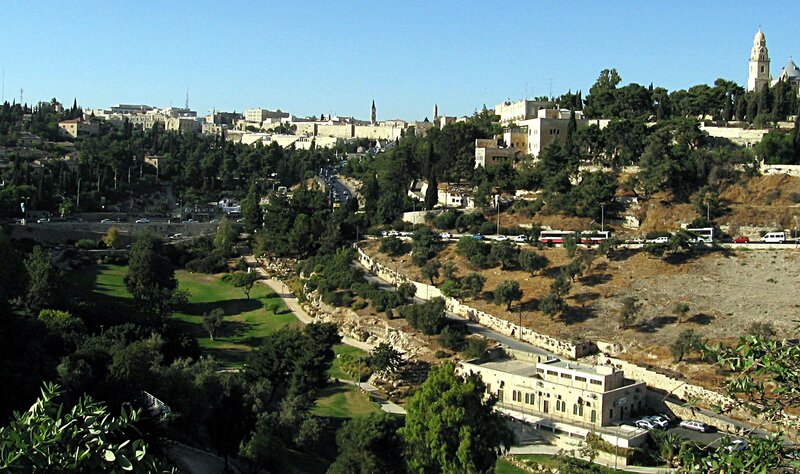 As it happens, I go to Israel every year, in addition to having spent time there in high school and graduate school. I agree that there are truly difficult issues to be solved, but I don’t believe that one of them is whether or not the Palestinians of today are the same as the denizens of ancient Palestine. Everyone knows they are not. I think it does everyone a disservice when the conversation is deflected from real issues and turned instead to ignorant dogma. I understand that not everyone has the resources to fact-check their opinions, but certainly CNN does. And I’m dismayed to find them using those resources to attack instead of to inform.